The summer report is in. The leading trend in the forecast in Greece suggests not to swim against the currents, but to go with the flow and let the wind guide you across the Aegean Sea to the mystical island of Mykonos, where luxury real estate makes way for an equally luxurious way of life. 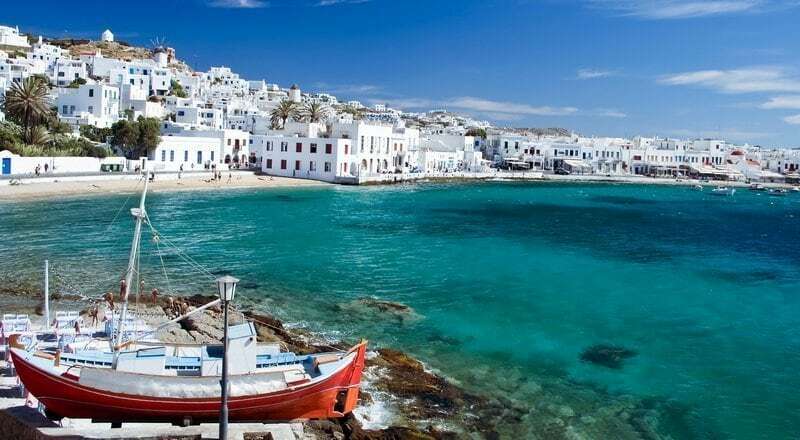 To lean into the pull of the winds is to invest in property in the island of Mykonos, a spectacular and sacred oasis adrift in the Aegean Sea, off the eastern shores of mainland Greece. Its naturally rugged landscape offers a gentle roughness, an idyllic scene of sandy and rocky cliffs embracing the azure sea. From a satellite view, the island’s tiny measurements might make it seem like the runt of the Cyclades archipelago – however small in size, Mykonos is powerful in impact. Part of the Mykonos mystique is its ability to attract crowds of summer vacationers seemingly out of thin air. In fact, the Island of the Winds, as it is so often called, has a reputation of drawing in tides of Athenians across the Aegean Sea (Athens is just a 3 to 5 hours away by boat) and whisking in jet-setters from around the world by air to Mykonos International Airport. According to our in-office calculations, Mykonos is the most popular summer vacation destination for Greeks and foreigners. As a result, the Mykonos market has become a paradise for renters, buyers, and savvy investors looking for a trendy vacation destination. Properties for sale in Mykonos present very interesting investment opportunities. To buy a luxury villa with a swimming pool and sea view in Mykonos is to secure family vacations full of joy and relaxation under the dazzling Mediterranean sun. Acquiring a residential complex with multiple villas arranged around landscaped outdoor spaces (verandas, bbq areas, swimming pools, garden lawns), perfectly in sync with nature on rustic plots just steps away from beaches, offer enormous potential as premier vacation rentals in Mykonos, with lucrative returns. When brought to the gates of heaven, how can you say no? To vacation in Mykonos is to experience a millennium of Cycladic history, heritage, and culture in a chic cosmopolitan atmosphere. The environment is suitable for vacationers with a wide array of interests and profiles. Mykonos is brimming with discoveries to be made on foot or by boat. The capital city Chora is full of lively streets lined with local shops selling regional products, charming old architecture, and whitewashed houses with bright blue doors, draped in berry-colored bougainvillea that will certainly bring out your inner Mamma Mia! Regular strolls through “Little Venice” are a must, if not to try out a different combo of gastronomic restaurants and bars every night, then to marvel at the famous Windmills of Mykonos overlooking the town and sea. Speaking of wind, Mykonos is also a go-to destination for surfers with dreams of catching major waves in the Mediterranean. Those who prefer a holiday with fewer risks can admire from a distance while tanning on a sandy beach. We recommend Paradise Beach for obvious reasons, not least of which is its crystal-clear waters. History buffs will find themselves overstimulated with sacred grounds to explore, such as the Paraportiani Church, a wonder from the Byzantine Era, as well as the religious relics of Ano Mera. But don’t feel like you have to stay on the island all day, every day. Head to Rhenia Island for a change of scenery, or take a relaxing yacht trip to the nearby island of Delos, an important archeological site and must-see landmark of Greek mythology. Ready the sails, and make your way to invest in the island of Mykonos.